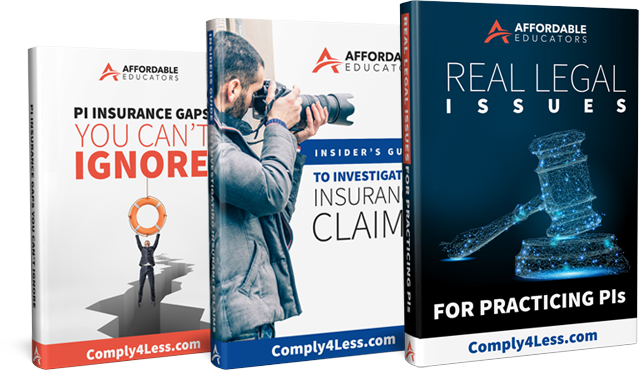 California Insurance CE – Need a new license? We do that too! • Pay After you Pass, Pay Only for the Hours you Need! In more than a dozen states, private investigators MUST complete Continuing Education every two years. Penalties for not complying can include loss of license and monetary fines. Need help deciding which course(s) to take? Click here. Thanks! Your company has very quick response times and your courses are very affordable! I’m glad I was referred to your company since I like to take courses the way you have them setup. Three Valuable Ebooks - FREE!